The XPedite7674 by Extreme Engineering Solutions (X-ES) a high-performance, 3U VPX-REDI, single board computer based on the Intel® Xeon® D processor. The Intel® Xeon® D processor can provide up to 16 Xeon®-class cores in a single, power-efficient System-on-Chip (SoC) package with native extended temperature support for up to 12 core count SKUs. XPedite7674 is one of many of Extreme Engineering Solutions' highly secure embedded single board computers, which can be paired with an X-ES rugged embedded system. 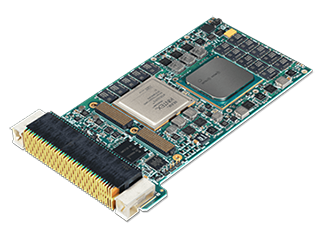 The XPedite7674 integrates SecureCOTS™ technology with the Xilinx Kintex® UltraScale™ FPGA for hosting custom functions to protect data from being modified or observed and provides an ideal solution when stringent security capabilities are required. The XPedite7674 accommodates up to 16 GB of DDR4-2133 ECC SDRAM in two channels and up to 32 GB of onboard SATA NAND flash in addition to numerous I/O ports, including USB, SATA, and RS-232/422/485 serial through the backplane connectors. Extreme Engineering Solutions, Inc. (X-ES), a 100% U.S.A.-based company, designs and manufactures Intel® and NXP (formerly Freescale)-based single board computers, networking products, storage products, power supplies, and system-level solutions for embedded computing customers. For further information on X-ES products or services, please visit our website: www.xes-inc.com, call +1 (608) 833-1155, or email us at sales@xes-inc.com.